For food and beverage processors incorporating sweeteners to their products, opportunity exists to reduce costs when efficiently utilizing granulated sweeteners (pure sucrose, fructose, or dextrose) as opposed to procuring them in liquid form. A high-level overview of the savings is: granulated sucrose in bulk is less costly than liquid sucrose delivered in tankers; the need to store and heat the liquid sucrose is eliminated and by going granular only a surge/storage tank that would typically hold a half-day’s production is needed. Another advantage to granular is that a fresh on demand batching operation can improve flavor profiles and the small batching capability may allow for more accurate temperature tolerance control that could help processing parameters downstream. When batching or liquifying granulated sweeteners, temperature and time are the two major factors to consider. First, we consider temperature. As the percent solids of sweetener in water increases, the minimum temperature must also increase to completely dissolve the sweetener. For example, to completely dissolve 67.5 Brix sucrose, a minimum water temperature of 21°C (70°F) is required, and to dissolve 65 Brix, a minimum water temperature of 8°C (47°F) is required. These temps are needed to maintain the sweetener in solution. Next, we consider time. Once a desired Brix level has been identified, the processing equipment must allow time for the sweetener to completely dissolve after it has all been added to the liquid. This chart in this article demonstrates the time it takes for 67.5 Brix granulated sucrose to completely dissolve. This required time cannot be reduced with higher shear levels. To achieve these levels, the crystals must be completely deagglomerated (lump-free) and must maintain a rapid particle velocity through the liquid until it completely dissolves. Crystals that remain un-agitated on the bottom of the vessel can remain for hours and may never dissolve. 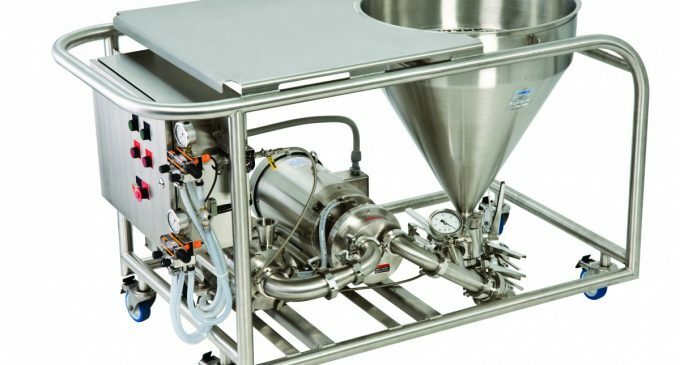 Once these basics are understood, a mixing system can be designed that introduces the granular sweetener into the solution in an efficient and effective manner. The sophistication of the system is solely dependent on the volumes to be produced and the capital available for the system and its ROI. Detailed and customized designs can be prepared by Admix, leaders in advanced mixing technologies, but here’s a quick review of two options. Admix Rotosolver® in-tank, high flow, high shear disperser for batch creation & hold. A properly sized Rotosolver can enable processors to add sugar at double the rate of many conventional mixers. For sugar processing, Admix recommends adding a mechanical powder feed from bulk bag or from bulk silo directly into the tank, and adding a simple tank jacket or inline heat exchanger to achieve and maintain desired temperature. Admix FastFeed™ inline powder induction and dispersion systems provide robust powder induction with moderate to very high shear rates. This technology allows dependable introduction of granular sweeteners directly into a liquid flow stream. In a single pass, these systems are capable of creating 44 Brix. On a recirculation loop, slurries up to 80 Brix are achievable. Admix has been assisting processors in the beverage, dairy, confection, cereal and snack food industries to design and operate efficient granulated sweetener batching/hydrating systems for over 20-years with powder addition rates up to 181 kg / 400 pounds per minute. Admix is well versed in the process pain points associated with sweeteners and is ready to assist with your mixing needs. For further information contact Admix on Tel +45 3213 8743, Email europesales@admix.com or visit www.admix.com.